Since the refugee influx from the Mediterranean spiked in 2015, when more than a million refugees and migrants reached the bloc, EU leaders have been at odds over how to handle them. 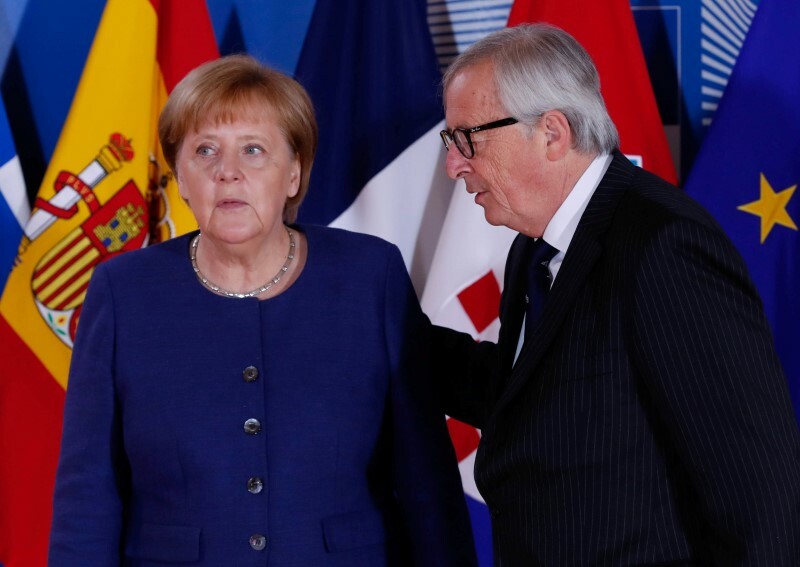 Brussels: German Chancellor Angela Merkel said on Sunday she would seek direct deals with separate EU states on migration, conceding the bloc had failed to find a joint solution to the issue threatening her government. Sixteen EU leaders met for emergency talks in Brussels on Sunday hoping to get a deal for the full summit of all 28 states on June 28-29. They will endorse further tightening of their external borders and giving more money to foreign countries to prevent people from setting sail for Europe. But they cannot agree on how to share out those asylum seekers who make it. “There will be bilateral and trilateral agreements, how can we help each other, not always wait for all 28 members,” she said. French President Emmanuel Macron offered his backing, saying the solution should be “European” but it could just be several states together. UN data shows only about 41,000 people have made it to the EU across the sea this year. But opinion polls show migration is the top concern of the EU’s 500 million citizens. Since 2015, migration has decided elections across the bloc from Italy to Hungary, with voters favouring a tougher stance. In response, EU has turned increasingly restrictive on asylum and pushed to curb arrivals, a strategy denounced by rights groups. Italy has long struggled to cope with arrivals and its new populist government rejects any idea that would see it handle more people. Rome has started turning away ships with migrants rescued at sea, saying it should not be the sole EU entry point. Malta could accept some in the coming days, sources said. Italian Prime Minister Giuseppe Conte, who said he was leaving Brussels “decidedly satisfied”, also wants to drop the rules stipulating that the first EU country of arrival is responsible for any given person. He said those who refuse to take in some of the new arrivals should get less money from EU coffers, an idea that is against the wishes of the four ex-communist states in the east who do not want to host anyone. EU states will agree later this week to spend more money on Syrian refugees in Turkey and provide more cash for Africa projects. They are considering setting up centres abroad to decide on asylum requests there and send back those whose cases fail. The EU would want the UN agencies for refugees and migration to run these sites. “A European solution means throwing more German money at things. We will be moving towards more cash and aid for places like Libya, we will beef up the EU border and coast guards, we will send more illegal migrants back,” one EU diplomat said. Merkel‘s conservative allies, Bavaria’s Christian Social Union (CSU), have threatened to start turning away at the German border those registered for asylum elsewhere unless the bloc agrees on spreading them around more evenly. Migrants mostly stay in arrival countries like Greece and Italy or the wealthy ones where they try to start a new life. But Hungary and Poland have refused to host any arrivals. Now backed by Austria, they want to end any further discussion on rules for sharing them out across the bloc. 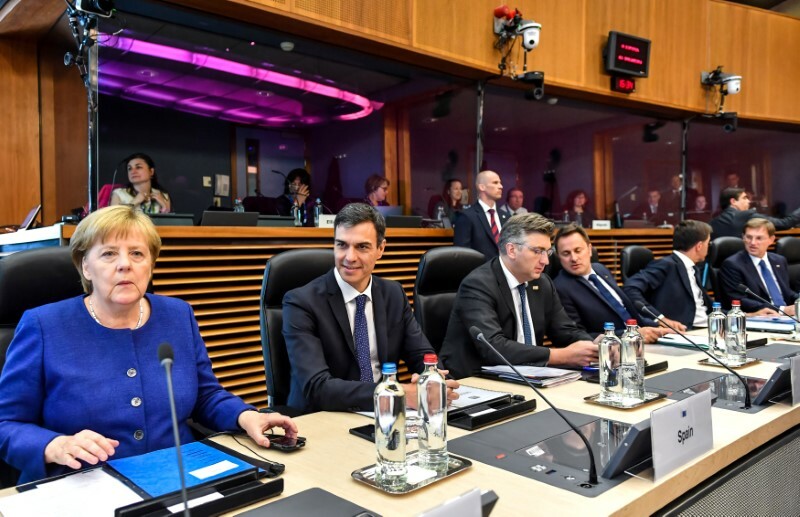 Bad blood from the deadlock has spilled over to other areas of cooperation, including talks on the EU’s seven-year budget from 2021. Merkel opposes the idea by the CSU, which faces off against the anti-immigration AfD party in Bavaria elections in October, as it would mean rigid border controls inside Schengen. That would have a knock-on effect on other EU states, hit cross-border business and travel. A poll published in Germany on Sunday showed the dispute was weakening support for Merkel‘s coalition and pushed the AfD to its highest ratings. Even though EU leaders agree they want to go on curbing arrivals through working with third countries like Tunisia or Niger, such accords are complicated, slow and costly. To convince the CSU, Merkel needs deals to stop migrants trekking north, as well as to send back to the coastal states those people who make it to Germany against EU rules. Conte said such secondary movements would not be a problem if other EU states helped Italy more in dealing with arrivals.